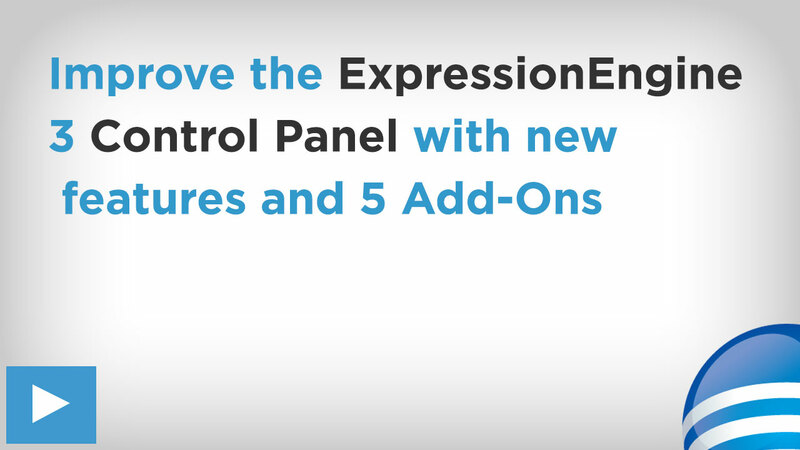 As expected the EE3 control panel is improved on from version 2. It’s still a little plain in my option, but that’s maybe me being a bit picky. As of date of this video (September 2016) there are currently 183 add-ons, there are roughly about 1800 EE2, so there is still a lot of work to be done by developers to get the add-ons compatible with the new version. Publish Notes is the first add-on to look at. It gives you the option of adding in custom text and html formatting into the publish screen. If you have anything more than a basic set of custom fields or option then this add-on can makes a lot easier for the content editors and publishers. Menu Manager was introduced in EE3.4, and it’s a bit improvement what there was in EE2. It allows you to create custom menus in the top left of the control panel. Any link can go in here, including links to add-ons which editors, admins or users need to access. It work’s in a drag and drop manner as it very easy to use. Whilst not an add-on it’s a great new feature to EE3. Pillster makes a very subtle change in the control panel. It makes the Status option into EE3 styled radio buttons rather than the default drop down menu. If the status option is something readily accessed by content editors then this add can save a lot of time. A tiny improvement, but in the right situation, useful! Layouts have been in version 3 from the first release. They allow you to drag and drop, which reorders your custom fields and options. Something not obvious to everyone is that you can drag and drop across the tabs. Meaning for instance you can put “Status” which is in the options tab into the publish tab. Any of the other custom fields can go in a different tab. New tabs can also be created. You have complete control over your custom fields and options. Field Group Clarifier is another subtle improvement on the default ExpressionEngine 3 control panel. It gives you more cutest of where you are when you are setting up your custom fields. It simply adds the information at the top of your custom field options. If you are creating dozens of custom fields then this minute improvement can helps thing go more smoothly. Field Limits gives content editors a limit on the number of character they insert into a custom field. There are 3 options, input, number and texture. They all do a similar thing, limit the number of characters the content editor can insert into the predefined custom field. Some of these add-ons covered are very small improvements. That’s OK! Small improvements add up to give big gains. On a complete tangent, the book i am currently reading is Black Box Thinking which discusses in part about improvements. Great book, fascinating! Hope that help’s you build better ExpressionEngine sites. Please comment below for anything you want to add.